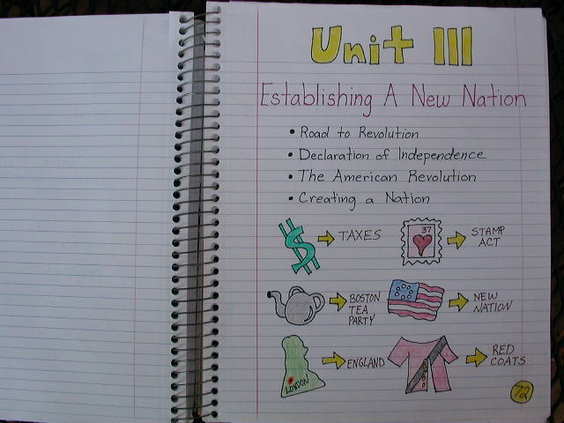 A complete study home school unit study of the American Revolution including. This unit study was built on a bunch of wonderful resources to fit the needs of my family. We live on the West Coast and don't have the privileged of going to American Revolution museums so I added as much virtual field trips as I could. I am an art teacher so of course I pulled as much art and hands on resources as possible. As we worked our way through the study I discovered several of my children didn't enjoy history as much as I...so, I created the week long version to make sure they have comprehension of all the important points without overwhelming weeks and weeks of information. or lack the desire to study the foundation of our country for a lengthy time. 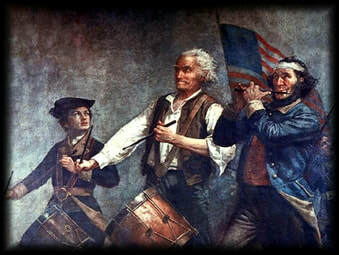 The American Revolution (1775-83) is also known as the American Revolutionary War and the U.S. War of Independence. Here are some wonderful resources I used to make my unit study. Thank you to those other teachers willing to share their lesson plans! Here is the list of Liberty’s Kids Episodes and who the “special guest” is on the show if you can use them. The Virginian George Washington gained valuable military experience in this war along with being noticed by both the colonist and Britain. At the battle of of Jumonville or l’affaire Jumonville, a battle between the French and English for the control of the Ohio Valley, ended in a British victory lead by George Washington. George Washington said “I ordered my company to fire” and before Washington could stop the killing and accept the surrender of the French, ten of them were dead, including their commander. This conflict made Washington famous along with his gaining military experience. As wrote by Paul Johnson in his book A History of the American People he said “Horace Walpole, in his History of the Reign of George II, was more accurate: “The volley fired by a young Virginian in the backwoods of America set the world on fire”. 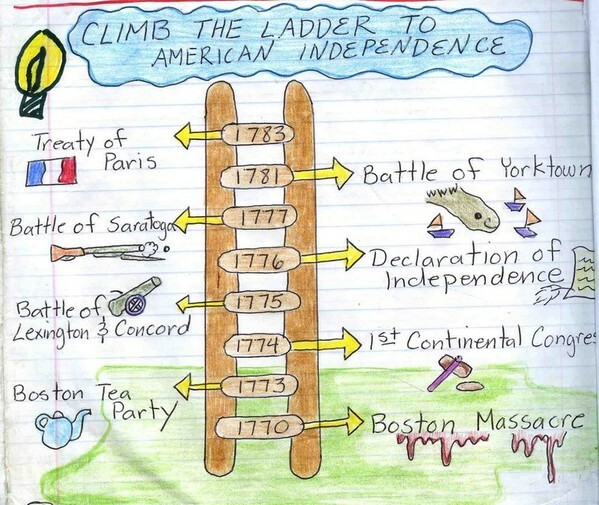 - Tina Dynamic Homeschool has a plethora of lapbook resource for the American Revolution. In protest of the taxes many people boycotted goods from the British. Instead of buying the goods they started making their own. We are going to cook colonial food, dance a minuet, learn a bit about portraiture, and write with quill pens. We’ll read the Stamp Act, and Declaration of Independence. We’ll memorize the preamble to the Constitution and Phillis Wheatly poetry. We’ll learn about the roles of slaves, free blacks, Native Americans, Jews, and women in the revolution. We’ll play a lot of charades. Do a lot of painting, drawing and hands on activities. Exploring historical events from multiple perspectives, and understanding how perspective effects interpretation. Using primary sources when available, and understanding the benefits of primary resources. Exploring art as a unique expression of the culture and sentiments of a historical era (by looking at poetry, portraits, and political cartoons). Take Virtual Field trips to National Museums and Historical places that were important during this time period. Talk about Boycott: Many colonist felt that England was treating them wrongly. They complained to the King. At last the British Government felt forced to drop the Stamp Act. Then they turned around and add tax to paint, paper, and tea sold in the American colonies. So the colonist refused to buy the goods that carried the new tax. ACT OUT the BOSTON MASSACRE: discuss who was to blame. History.com video - I dislike that we have commercials on this site but I can't find another video. Read these two articles about the Colonist and their reaction to the taxes. Eyewitness to History has primary source narration from George Hewes and his part on the Ship dumping Tea. Every child will fold their paper in half lengthwise. On the left, they’ll write “Accurate,” and on the right “Inaccurate.” I’ll ask them to watch “No More Kings” from Schoolhouse Rock, looking for accurate and inaccurate depictions in the video. After watching it once, I’ll give them a few minutes to fill in their papers. Then we’ll watch it again, looking for inaccuracies and accuracies. Next, I’ll have them get with a partner to make a joint list. Finally, we’ll make a giant list on newsprint, with one point for each answer they come up with. If they get more than 10 points, I’ll let them have a two-minute dance party. Activity 2: Read Longfellow’s Midnight Ride of Paul Revere. Choose and Memorize any stanza from poem. All delegates agreed that Parliament was exerting too much control. It issued a Declaration of Rights protesting Great Britain’s actions. Students will recite the stanzas they memorized, and we’ll discuss what we like about the poem and what was misleading. Each student will then make an interactive 3-D map. You can find the lesson plan (which is excellent) and all of the materials to print in the book Interactive 3-D Maps: American Revolution. The map allows you to teach about Paul Revere’s life, as well as the ride. We’ll watch “Shot Heard ‘Round The World.” After watching it we’ll discuss why people call the battles at Lexinton and Concord the shot heard ’round the world. I’ll read them the beginning of the Emerson poem “Concord Hymn,” which is the origin of the phrase. We’ll talk about why no one could have used that phrase until decades later. About the Author. Summary of the Story. We are going to do 2 portraits for this unit. The first is a simple silhouette. Because my students are siblings we are going to make them stacked together so they will hang as 1 framed portrait. Complete the Patriots of Color Packet (reading and crossword). Look at the interactive Map and label our own. Activity 2: British Victory at Bunker Hill We’ll watch a short clip of the Battle of Bunker Hill from the History Channel. Students will break up into two groups to come up with arguments to support one of two positions, either that the colonists or the British won the battle. Activity 3: Timeline Game I will fill two trash cans with 20 inflated balloons in each. 10 of the balloons will have events written on slips of paper and taped to the balloons. Students will form two teams. When I say go, the first person from each team will run to the trash can, pull out a balloon and bring it back to their team. When they tag the next person, that person will go to the can and pull out a balloon. This continues until they find all ten balloons with slips of paper. While the team is getting balloons, members who are not running can pull off the slips of paper, and arrange the events in order. They will tape the events on a poster board, and write the year of the event next to it. The first team to correctly complete their timeline wins. Events: The End of French and Indian War, Sugar Act, Stamp Act, Stamp Act Congress, Quartering Act, Boston Massacre, Tea Act, Tea Party, Intolerable Acts, Battle at Lexington and Concord, General Washington takes over command of the Continental Army, 1st Continental Congress, Phillis Wheatley writes “To His Excellency George Washington,” Battles of Bunker Hill and Breeds Hill. During the tea, we will teach the kids how to dance a minuet and a jig. 1.Discuss with students the impact that Enlightenment ideas had on the colonists. Explain that the main ideas of John Locke, such as the belief that all human beings are created equal with certain unalienable rights, were influential to such colonial patriots as Patrick Henry, Thomas Paine, Thomas Jefferson, and Benjamin Franklin. Tell students that they will examine excerpts from the speeches and/or writings of Thomas Paine and Patrick Henry that illustrate these enlightenment ideas and that argue for self-government and independence from Britain. 3. Click here for the worksheet. Watch Schoolhouse Rock “Fireworks.” We’ll watch it a couple of times and have the kids sing along and recite the introduction to the Declaration. Give students white t-shirts and fabric markers. Have them design a t-shirt to take home. It should have one of the slogans we have learned in the class, or a phrase from the Declaration. (Examples: Give me liberty or give me death. Taxation without representation is tyranny. Life, liberty, and the pursuit of happiness. Join or Die.) The shirts should also have a symbol/picture that illustrates or amplifies the phrase. Read Forge by Laurie Halse Anderson; Rewrite 10 more of Washington’s Rules in your own words. Each student will make an interactive 3-D map. You can find the lesson plan (which is excellent) and all of the materials to print in the book Interactive 3-D Maps: American Revolution. The map allows you to teach about Washington crossing the Delaware. The front cover of the book states the projects are “maps that students make and manipulate to learn key facts and concepts – in a kinesthetic way!” My kids love them. Students will get in groups of three or four, each one taking on a character from the boat. They will write a quick character description with a bit of history (where are they from, how did they end up in the boat, etc). Then they will come up with a skit, showing the three or four characters in one fictional scene that took place sometime before the night crossing of the river. Choose 5 that you believe are important and then rewrite them in your own words. The rules can be found here. Learn song’s original meaning and write new lyrics based on two event we have studied. For background knowledge and lyrics, read pages 4-8 of this lesson plan, from the Education Department of the Mount Vernon Estate and Gardens. With remaining time, students can play the game they designed. Watch the student produced video on the Treaty of Paris. Many important facts are presented. A virtual Trip to the National Archive to see the Declaration of Independence, The Constitution and The Bill of Rights. Objective: What happened during the American War for Independence? What do you know about the American War for Independence/American Revolution? List 5+ people, places, ideas, events, etc. that you think are related to this period. Make educated guesses even if you're not sure. Review exam. Create Time Line identifying and defining major events between 1763-1783 using the time lines and definitions in the book. Add pictures to 5 of the events. Watch Schoolhouse Rock “Three Ring Government” and “Preamble.” We’ll watch the Preamble a couple of times and have the kids sing along and recite the introduction to the Declaration. The election of the first President was by appointed electors, not by a general election. All states that had approved the Constitution by the first Wednesday in January 1789 would appoint electors on that day. Those electors would assemble on the first Wednesday in February 1789 and vote for a President, and the business of running the government under the new constitution would begin a month later. Using a copy of the Senate journal, from April 6, 1789, students will work in pairs to make a bar graph of the electoral votes for the 1st president. We’ll discuss which states had the largest and smallest populations, and what might have changed the election’s outcome.